Safety. Carpet on the stairs provide a record of carpet to ensure the safe movement of people. Aesthetics. Variety lineup nashh carpet, always accentuate and beautify your interior design. Practicality. With the help of our carpet, you can easily replace or clean the carpet without damaging the surface levels and bases of the coating. Brass, an approximate color to gold, successfully combined with a classic interior. Stainless steel well suited to the chrome interior details (railings, door handles, etc.) or a Hi - tech style. Aluminum - economy proposal. The choice of rod diameter in relation to the width of the carpet. Full-body rod - 1 pc. Holder (attaching a step) - 2 pcs. Tip Decorative - 2 pcs. Pin holder - 2 pcs. Anchor (expansion for the step) - 2 pcs. 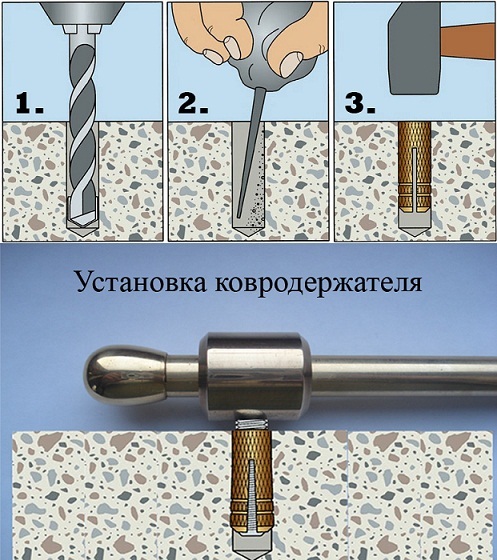 Carpet can be supplied without lugs. 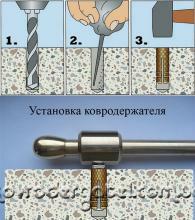 Drill a hole d = 10mm. Stop anchor to score in the stage. Pave the carpet and collect carpet.